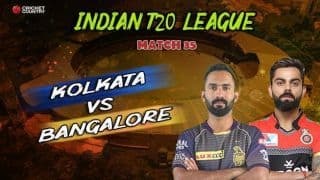 We're done with this one, but Indian T20 League action continues. Next up, on Monday, we have Mumbai welcoming Bangalore to the Wankhede Stadium at 2000 local (1430 GMT). Do join in for that one. Goodnight and take care! Man of the Match, Keemo Paul says that it is a dream come true for him and thanks everyone for the support. On playing the Indian T20 League, Paul says that it is the biggest league in the world and he just wanted to enjoy it. On his slower deliveries, Keemo says that the back-of-the-hand deliveries came out pretty nicely and it was all about adjusting to the pitch and the conditions. Regarding his batting and the big six that he hit, KP says that he enjoys his batting. Ends by thanking everyone who supported him to get to this level. 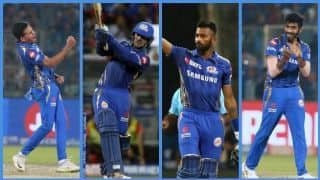 Delhi skipper, Shreyas Iyer says that he and Rishabh Pant had decided that they will try to stick around for as long as possible and one of them will take charge due to the slowness of the surface. 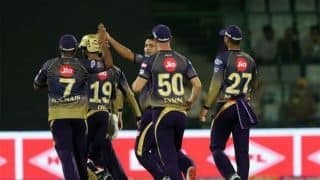 Mentions that Axar Patel and Keemo Paul's cameos helped them get to a fighting total. Ends by saying that they have good team spirit and wants his side to continue having that. Kagiso Rabada says that they had a game plan and they just stuck to it and hoped it to go their way. On his variations, Rabada replies that it's been a trend so far and you have to vary your pace to succeed in this part of the world. Lauds Keemo Paul and Chris Morris for doing a brilliant job. On the leadership role in the squad, Rabada thinks and says that he has the responsibility on his shoulders and he just wants to do his best and do everything for his team. Talking about his catches, Rabada mentions that you have to do your best and also tells that they are working hard in all the departments. 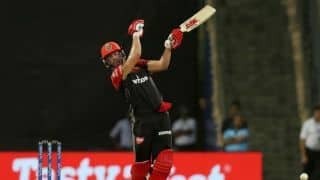 Hyderabad skipper, Kane Williamson says that their bowlers did a great job but admits that they didn't get going in the second half. Terms it as an unfortunate performance and credits Delhi for playing well. Mentions that there is no room for complacency in this tournament and feels that they didn't execute their plans well. States that Delhi adapted well to the demands of the surface and used their change of pace to good effect. Delhi will be mighty pleased with this performance. They only had a decent score to defend, so execution was key. Bairstow and Warner's start would have put most teams off, but when you have the likes of Rabada, Morris and Paul in the team, anything is possible. These three bowlers shared the 10 wickets between them. Paul kicked things off getting Bairstow and Williamson, then Rabada and Morris cleaned house in the death overs. Paul finished with 3 along with Morris, while Rabada got 4 to his name. A great performance from Delhi. No better way to sum it up. This could be one of the best bowling displays in the history of the competition. Three consecutive defeats on the bounce for the hosts. Chasing 156, Warner and Bairstow once again got their side off to a good start, adding 72 between them before the Englishman departed. What followed was unimaginable. From 101/2 in the 16th over, they got bundled out for 116 before the 19th over even ended. Barring the two openers, nobody even got into double figures. A truly astonishing fact. 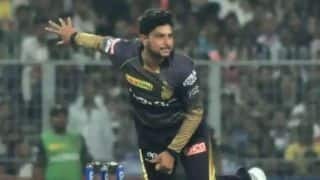 End of over 19 ( 4 Runs )SRH 116/10 Khaleel Ahmed* 0(1)Sandeep Sharma 1(1) 10 wickets down for SRH. Out batsman is Khaleel Ahmed. It is all over for SRH. 18.5Kagiso Rabada to Khaleel Ahmed. out, OUT! Take a bow, Kagiso Rabada. He's wrapped Hyderabad up before the game even goes into the final over. Fires an accurate yorker on the stumps, Khaleel can't do much about it. The furniture behind is rattled and that's the end of this contest. 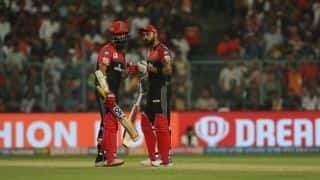 DELHI WIN BY 39 RUNS! Khaleel Ahmed is the last man in. 3 wickets for Kagiso Rabada. Kagiso Rabada is on a roll. 18.4Kagiso Rabada to Bhuvneshwar Kumar. out, OUT! Rabada has his third of the night. Will Hyderabad even survive the 20 overs? A short ball, Bhuvneshwar Kumar backs away and tries to slap it. But it goes off the top edge and Rabada runs to the ball at the striker's end and takes it himself, just about avoiding Pant who also comes in to take the catch. 3 wickets for Kagiso Rabada. Kagiso Rabada is on a roll. 18.4Kagiso Rabada to Sandeep Sharma. wide, 2 runs, Wide! Short ball but it's too short, wide signalled. And since Pant can't collect it cleanly, the batsmen take a bye. 18.3Kagiso Rabada to Bhuvneshwar Kumar. 1 run, Full on the stumps, Bhuvi hits it straight back. Rabada tries to cheekily deflect the ball on the stumps at his end with his left foot but it goes wide. A single is taken. 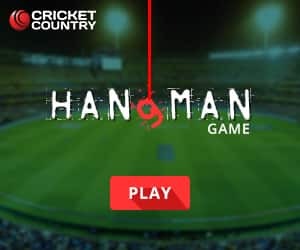 18.2Kagiso Rabada to Bhuvneshwar Kumar. no run, Bhuvneshwar tries to make room, so Rabada follows him with a well-direct bouncer. The batter can't make any sort of connection. 18.1Kagiso Rabada to Sandeep Sharma. 1 run, Outside the line of off stump, Sandeep plays it through point and gets to the other end. Sandeep Sharma walks out to have a go with the bat. End of over 18 ( 4 Runs )SRH 112/8 Abhishek Sharma* 2(3)Bhuvneshwar Kumar 1(1) 3 wickets for Chris Morris. Chris Morris is on a roll. 17.6Chris Morris to Abhishek Sharma. out, OUT! Third of the over for Chris Morris. Hyderabad have just crumbled here. Unreal collapse. Morris comes from around the wicket and bowls it full on the stumps, slower in pace. Sharma is early into the shot and ends up handing a high, yet relatively simple chance to Paul at cover. So, five wickets for 8 runs in the last two overs. Unreal. 17.5Chris Morris to Bhuvneshwar Kumar. 1 run, Goes really full on off stump, Bhuvneshwar pushes it to covers and takes one. 17.4Chris Morris to Abhishek Sharma. 1 run, Good length delivery in the channel outside off, cut through point for a single. No hat-trick for Morris. Bhuvneshwar Kumar is the next batsman for the hosts. He will face the hat-trick ball. 17.3Chris Morris to Rashid Khan. out, OUT! Gone first ball! Now it's Morris who's on a hat-trick. Back of a length delivery as the big all-rounder hits the deck hard, Khan takes the pull on and hits it over mid-wicket. Straight down Keemo Paul's throat who takes it safely. From 101/2, Hyderabad are 110/7. Unbelievable. 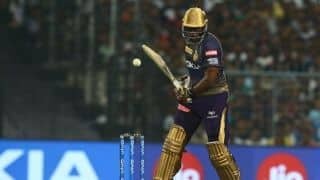 Keemo Paul, Chris Morris and Kagiso Rabada’s trial by pace caught Sunrisers Hyderabad (SRH) napping as Delhi Capitals (DC) beat the home team by 39 runs in the 30th match of the Indian Premier League (IPL) 2019 at the Rajiv Gandhi International Stadium in Hyderabad on Sunday. While Paul and Morris scalped three wickets, Rabada returned with the figures of 4/22 as SRH collapsed despite Jonny Bairstow’s half-century and David Warner’s 41. The pace-bowling duo, alongside Morris, ran through the SRH batting line-up as the home team imploded, losing their last eight wickets for 15 runs. 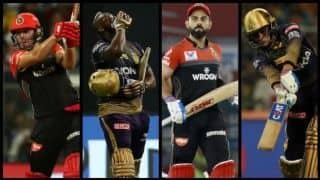 The likes of Kane Williamson, Ricky Bhui, Vijay Shankar, Deepak Hooda and Abhishek Sharma scored 3, 7, 1, 3 and 2 respectively as SRH lost the plot in the chase of 156 on their homeground. DC, who completed a hat-trick of wins, moved to the second spot in points table. 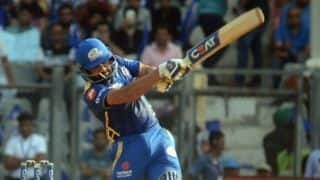 provided SRH with a bright start as Prithvi Shaw suffered yet another failure and Shikhar Dhawan failed to take off from where he had left in the previous game. While Shaw scored 4 runs, Dhawan perished for 7 as DC were reduced to 20/2 in the fourth over. Chris Morris too could not do much with the bat as Rashid Khan got the South African out for 4 to left DC reeling at 133/6. While Axar Patel scored 14 and Keemo Paul added 7, DC were restricted to 155/7.